Ebel watch series include the Beluga, Classic, 1911, Discovery, and Brasilia. From rugged outdoor models to dainty and refined luxury watches for ladies, Ebel prices equate to Swiss watch-making excellence. Ebel watches have a long tradition for workmanship and excellence. Founded in 1911 in La Chaux-de-Fonds, Switzerland, Ebel watch designers see themselves as architects of time. Ebel watches are designed, produced, and tested within the Ebel watch company's own Swiss workshops. 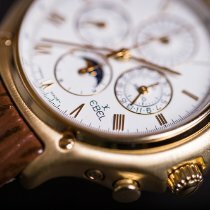 Ebel prices reflect the exclusive luxury and premium craftsmanship in each Ebel watch timepiece, such as the classic 1911. 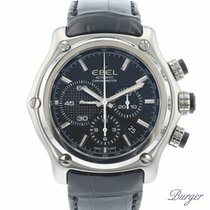 There are several Ebel watch series from which to choose. The sporty Classic Ebel watch series comes with chronographs or analogue dials for both men and women. The Brasilia is a beautiful Ebel watch that features soft, youthful looks for women and stark, masculine form for men. The 1911 line caters exclusively to men; these Ebel watches are rugged with refined design and many features. The Discovery series is a luxury sports watch with an aluminium tachymetric scale on the bezel. Beluga, an Ebel watch line for ladies, features elegant simplicity.